Throw this titan into a tizzy and you had better take cover! But once the tantrum tapers off, it's wide open. Enemies who enrage this epic elephant had better take cover! But once the tantrum tapers off, it's wide open. 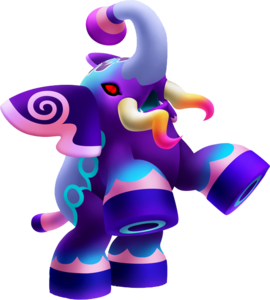 The Zolephant is a Dream Eater that appears in Kingdom Hearts 3D: Dream Drop Distance. The Zolephant's name is derived from "Elephant" (象, zō? 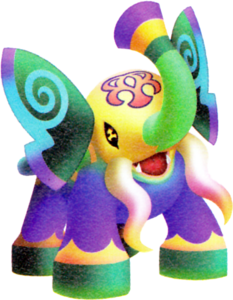 ), so that its name is essentially "Elephant Elephant." 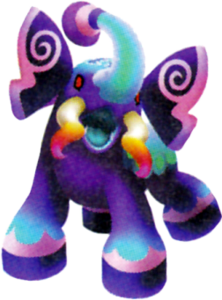 This is fitting, as both forms of the Zolephant have the general shape of an African elephant. During the Festival of Fools, Quasimodo unwittingly rides a Nightmare Zolephant, until it throws him off and attacks. ↑ Becomes Magnet Spiral after Secret: Red at G-4 has been unlocked. ↑ 2.0 2.1 Becomes available when in Fighter disposition. ↑ 3.0 3.1 Becomes available when in Nozzle-Nose disposition. Sora obtains the Zolephant Recipe after he saves Quasimodo. The Zolephant can be created through four different recipes.